Coinbase is launching a high-security vault service to complement its existing wallets. The motivation is to make the most of two competing qualities of bitcoin storage: easy-to-use and frictionless, versus security. It is difficult to achieve both in a single product, where more of one often entails less of the other. The vault is compared to a savings account, used less frequently and intended for the long-term storage of large quantities. Protection of wealth against loss and theft is paramount; users don’t mind having to take a few extra steps to access their funds every so often. The vault adds two security options over and above the offline cold storage already used with Coinbase’s wallets. First, withdrawals can be delayed by 48 hours to allow Coinbase to authenticate the requester’s identity through various communication channels. Second, organizations can create multiple approver schemes. For example, 2 of 3 or 3 of 5 pre-selected approvers need to sign off on every transaction. The wallet, on the other hand, is designed to be more like a chequing account. Smaller quantities are stored and transactions are more frequent. As such, fewer hurdles need to be cleared when managing funds. 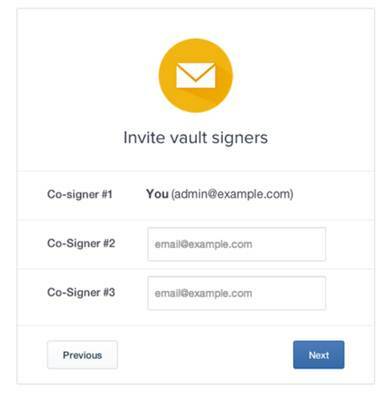 Coinbase also plans on launching multi-signature (multi-sig) technology in the coming weeks to help vault clients better manage security. With this technology, a potential attacker must negotiate multiple points of access, as opposed to a single key. For example, a 2-of-3 key scheme issues 3 keys and any 2 can be used to sign the transaction. It significantly reduces the risk of theft while still allowing relatively easy access to legitimate users. The new services appear destined to directly compete with those of BitGo. While not as big as Coinbase, they have been leaders in this niche through their offering of enterprise-grade security features, which include multi-signature technology and user management tools. BitPay endorsed their solution for their merchant clients. Recently, they secured $12 million in Series A funding. Coinbase already supports 1.4 million customer wallets. Users can add as many wallets or vaults as they like to their account. 5% of customers have already been enabled to join the service. The full launch is slated for July 16.